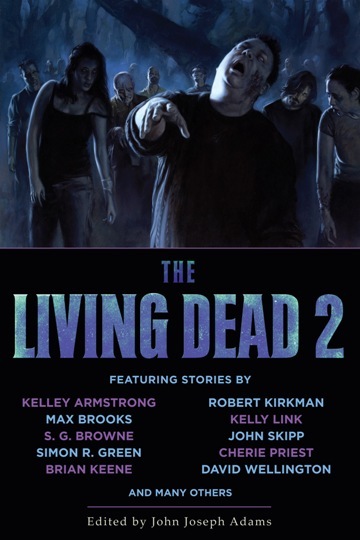 As you can see, the big new zombie anthology, The Living Dead 2 (Night Shade Books), is out this month. 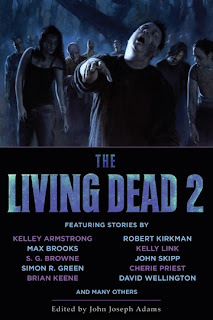 If you've read the first Living Dead collection, you know that alone is good news, because the editor, John Joseph Adams, has a gift for finding zombie stories that jump beyond the usual genre tropes. But this second collection is of special interest to me, because it includes a story of mine, The Mexican Bus. I've written half a dozen novels, but this is my first short-story, and I'm kind of excited about it. Ever since I was a kid I dreamed of writing short fiction like so many of my childhood idols: Isaac Asimov, Ray Bradbury, Harlan Ellison, Stephen King, Raymond Carver--too many to name. So now I've finally done it. Maybe in ten years I'll have written enough short stories that I can get a whole anthology all to myself...or maybe not. Either way, I'm happy just to be included alongside modern masters like David Wellington and Bob Fingerman. I opened Walter Greatshell’s Xombies not expecting much different from the usual run of zombie books . . . not that I’m averse to that, or I wouldn’t have been interested in reading Greatshell. However, that’s not what the book is about. Xombies is about one of the few females left on earth after a specifically tailored virus has wiped out most of the others. In a harrowing series of events, Lulu and the man who may or may not be her father make it onto a submarine that’s on its way to an unknown destination while most of the world is busy destroying itself. Lulu is surprisingly likeable and human, because she has plenty of failings, though her courage shines through. There are other books in this series, and I plan on reading them, because it would be a shame to leave Lulu in the situation at the end of Apocalypse Blues. Congrats, Walter, on both counts! I've yet to get into True Blood but I've heard it's very addicting. I can't wait to read the short story!